Some days in Ireland, the pale lemon light of morning manages to squeeze itself in between land and sky. It’s an extraordinary light, softened and filtered by heavy rain clouds hanging low and cushioning the land. Shapes are softened. Colour is muted. Across the patchwork of fields, veils of rain approach the land. These sorts of ‘soft day’ exude an understated beauty, don’t you think? 12″ x 12″ x 1.75″, Acrylic on deep edged canvas, ready to hang. $397 (approx. €339, £302) with free shipping. The day is coming to a close after the rain. The land is drenched. Have you experienced a day like this when a rain-sodden day turns into a shimmering evening with wonderful bright light, particularly in the west? It’s always with delight and surprise. The heavy grey clouds have dispersed to let billowing white clouds rise into the air and morph. 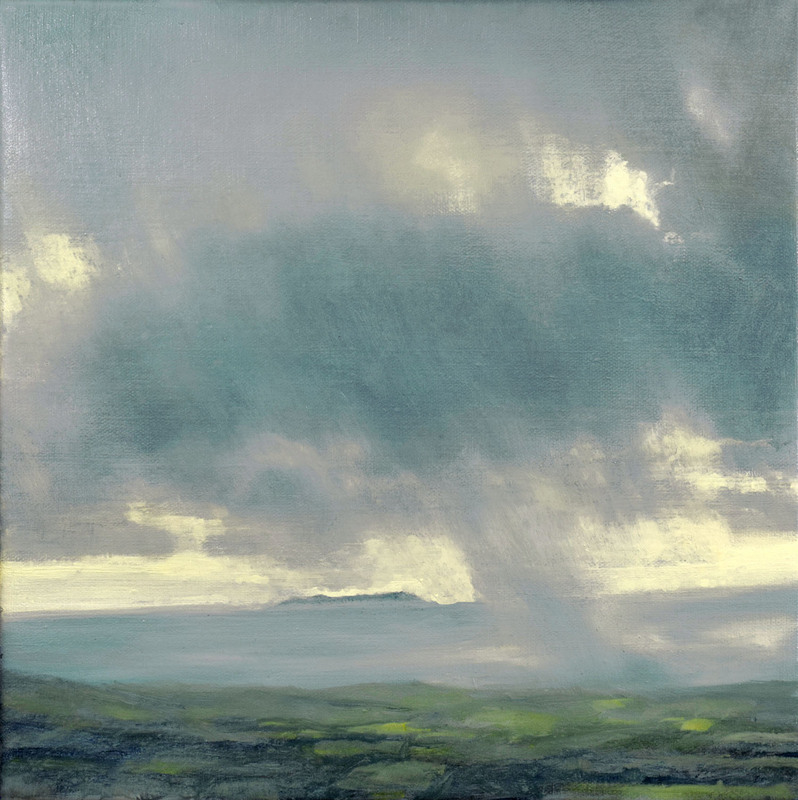 The painting depicts that moment when the cloud teeters before falling and changing shape again while lights come on on the island dwarfed by the large vapour mass. This week, I have also included images of a couple of large, 31″ x 31″ work-in-progress pieces. I thought you might find it interesting to see how they look now and how they’ll end up in the coming weeks when I publish them of this blog, fingers crossed. I’d love to read what you think about the paintings. 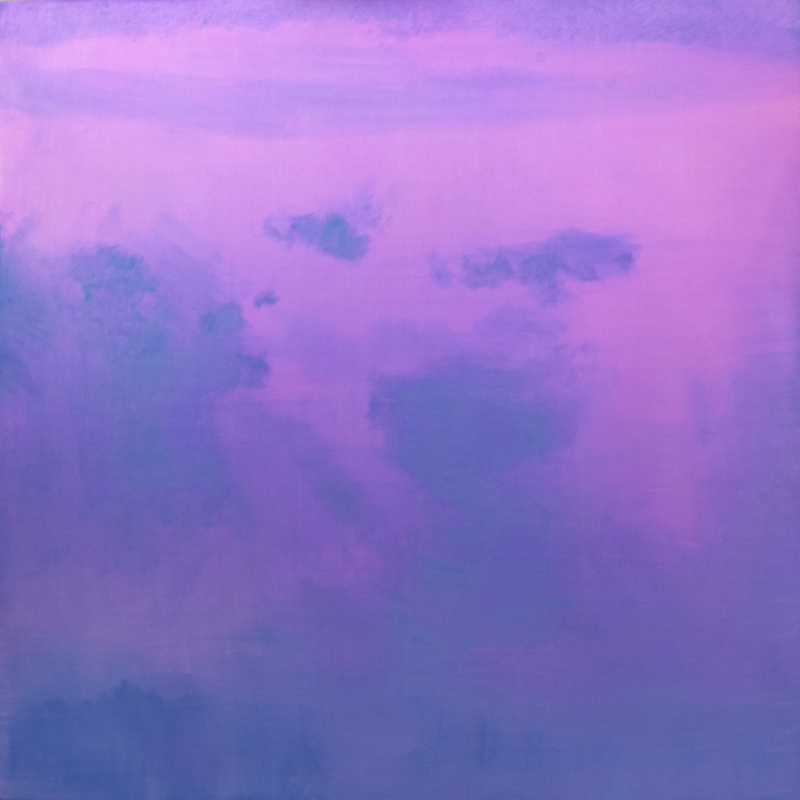 I am very drawn to the delicate and subtle colour of ‘Morning Light’; soft and diffused, misty and muted. 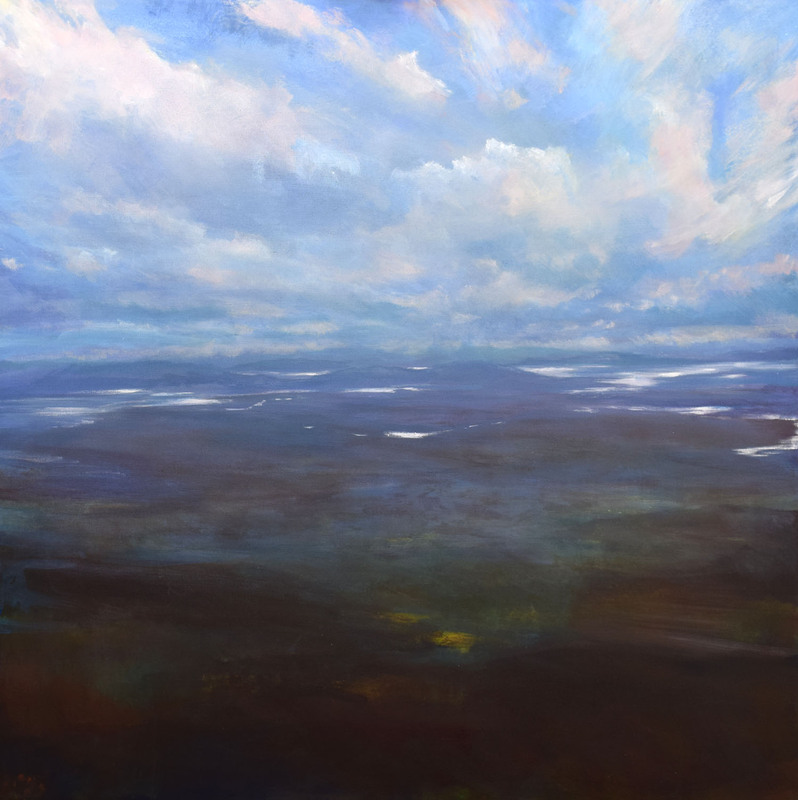 It is beautifully painted to match the beauty of the land itself and I really feel a sense of rain descending from the vapourous clouds. The colour palette seems to highlight the stone walls surrounding the fields to create a three dimensional effect. 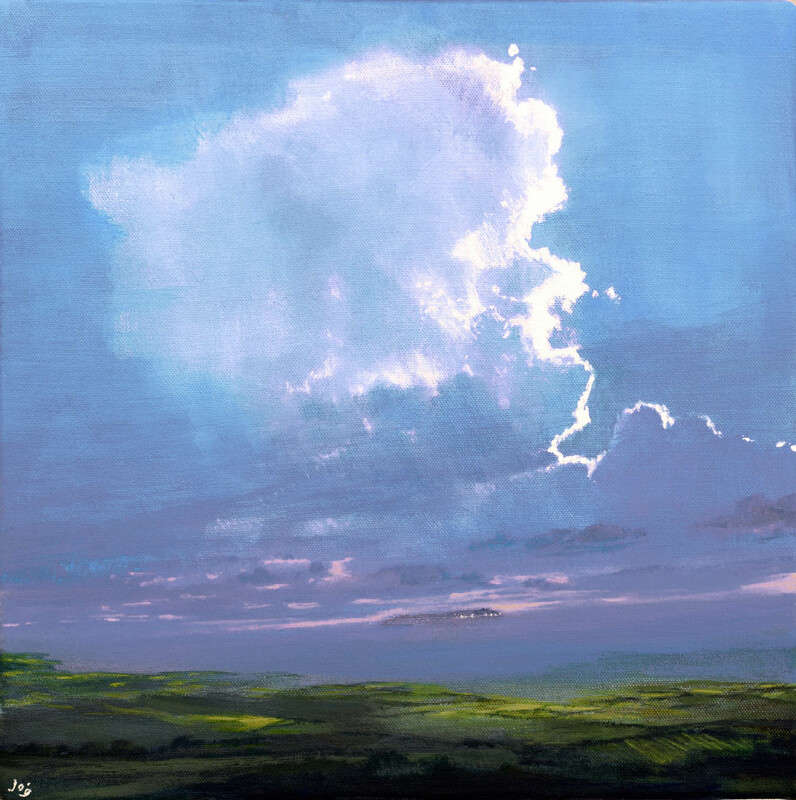 In ‘Evening Light’, for me it is the huge cloud that domintes and it out me in mind of a line in ‘Rural Reflections’ by Adrienne Rich “It is the cloud that swallows up the sky” but as always it is the island, the lights and the people the captures the imagination. It will be interesting to see how the two works in progress develop but there is so much to wonder at already in ‘Achill’ ! Good luck with the next stage John.